baingan/vange/brinjal. Instead of directly heating under fire heat tawa and on it keep the oil coated eggplant and char it on all sides until its cooked. Take 1 tsp of oil in your palm and coat completely on the eggplant.Press fork in7-8 places on the eggplant. Heat the tawa & place eggplant on the middle of the tawa,Turn all sides so that it will be charred or scorched well.. Allow it to cool for sometime.The skin comes out easily and oil secretions also comes out if any,inside it will be cooked and becomes soft. Cut the inner pulp into medium pieces. Heat 1/2 tsp oil and roast urad dal,chana dal and turn it golden brown,then add red chillis,asefotida and tamarind and in minutes it becomes crispy. In a mixer grind the roasted ingredients with eggplant and salt. Make it a coarse paste.Don't add water. 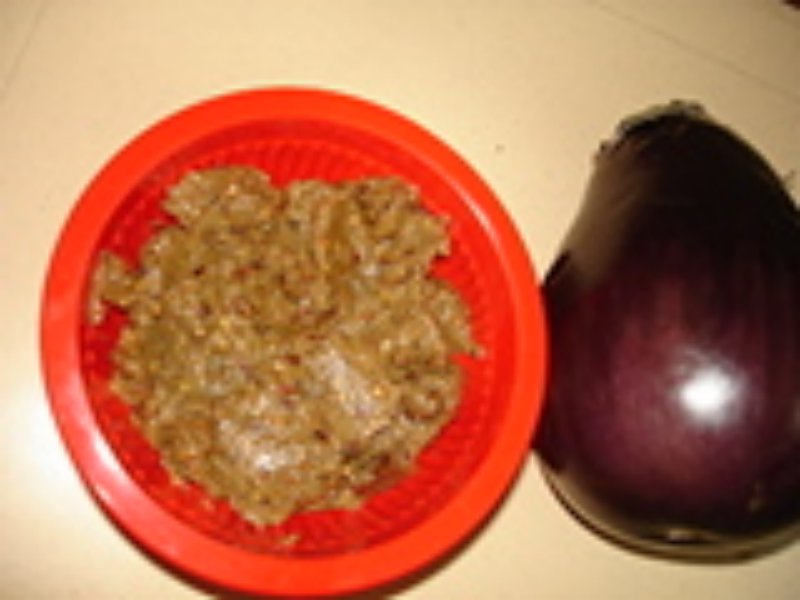 Again heat oil,splutter mustard and add this to the coarsed eggplant thogayal. Yummy Katrikai thogayal is ready.Serve with rice and gingely oil. Its not black urad dal.its urad dal. is it black urad dal?